I heard about the PS4's roach problem at an independent console repair shop on the Lower East Side of Manhattan. XCubicle is a clean and well-kept business where locals drop off their broken consoles to get diagnosed and repaired. Its co-founder, Patrick Che, was listing the types of repair issues he encounters on a day-to-day basis: coins inside disc drives, 3DS mods gone wrong. That's when he pointed to the "roach bags," black garbage bags heaped up in the corner of the room. "You see those bags?" he asked. "Those are bags full of roaches. Those are all dead by now." Che added that roach-infested PS4s are so common that XCubicle now charges a $US25 ($33) "roach fee." They get at least one each week. Other console repairmen interviewed say that at least half of the PS4s they receive are loaded with roaches. In cities, anywhere dark and warm runs the risk of hosting the horrible Periplaneta Americana. Most consoles lie horizontally in dark or enclosed areas, like media centres, so they're pretty welcoming to the little critters. Roaches make their way into Xbox Ones sometimes, too. Console repairmen tend to get more PS4s in than Xbox Ones in part because there are more PS4s out there, but according to independent console repairmen interviewed, the PS4 also has the most to offer as a roach hotel. The PS4's design accommodates roaches better than other consoles' because its ventilation grates are wider. Those vents are located at the bottom of the console, so roaches can get in with ease. Also, according to repair professionals, the PS4's insides gets hotter than the Xbox One's because of its internal power supply. Warm, in an enclosed space and close to the floor, PS4s are great roach nesting grounds. 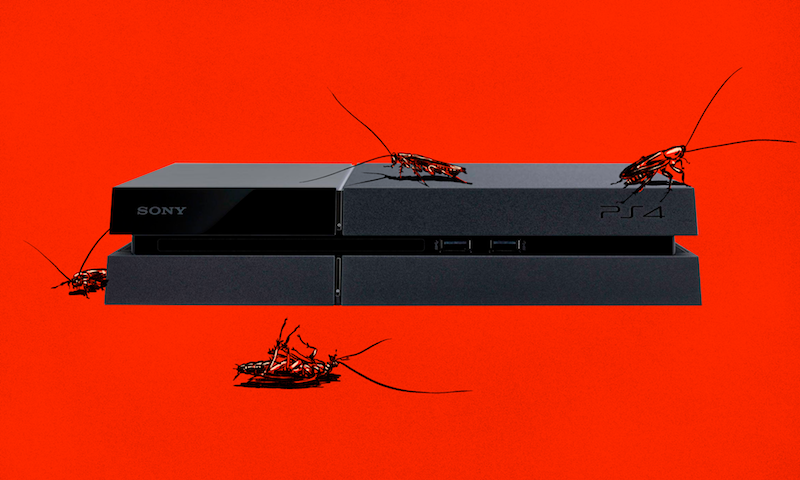 Roach-infested PS4s are a big problem. Especially because Sony won't take them in for repairs (Sony did not provide comment). Instead, independent console repairmen have the pleasure of scrubbing the roach crap off your console's power supply. Matt Zieminski, who works for console repair suite iFixit, told me that most of the time, the consoles aren't sent in for roach cleaning — the users don't know they're infested. The PS4s just stop working and the owners don't know why. Turns out, the PS4's internal power supply fries roaches onto its components, which can stop the PS4 from turning on. When the bugs have made little homes in there, and have little roach kids, those roach kids and their faeces can melt onto the hardware. Zieminski knows a PS4 is infested because "roaches leave traces," he says. "Their poop colour is distinct and has a certain smell to it. We kind of know right off the bat if there are poop stains on the vent of the fan — we assume it's bug-loaded." To get it working again, console repairmen usually replace the power supply. Then, they will take the console apart, sterilise it with an ultrasonic cleaner and put it back together. How do gamers prevent this disgusting and traumatic scenario? PS4s should be stored in the open, where they have enough airflow for breathing. They should also be stored higher up, so roaches have a hard time climbing to them. And of course, you should keep your house/apartment/unit clean. This piece originally appeared April 2017 and has been retimed to highlight the wonderful contributions women have made to Kotaku Australia over the years, our way of acknowledging International Women's Day. welp, guess I wont be becoming a ps4 repair guy anytime soon. I'd heard about this for a long time, never saw it for myself until a month ago. I had a customer bring in a PS4 for a replacement, the calls had been made and it was pretty much just a straight swap, but they had a disc still in the drive so I had to do a manual eject. To do this you have to pop the faceplate off and 'lo and behold the console was a roach nest, the customer was as shocked as I was. Even worse, this was the 2nd model of PS4 where you had to take the hard drive out to get to the eject screw, cue even more roaches. After ejecting the disc, I sprayed the hell out the console, crammed it into a plastic bag, duct taped the hell out of it and along with the paperwork wrote "Warning: Roach Nest" on it, along with a little cartoon cockroach. We get our house sprayed every 6 months, We got German cockroaches bad from the neighbor once, I noticed a roach cral out the back of my ps4 to my dismay so i took it apart & cleaned it, Removed a few dead ones, I put the console back together & that very night a roach shorted out the power supply by causing an electrical bridge between two pounts, The ps4 was sent away & had 3 components replaced & roaches removed, A week outside of my warranty the repair business gave me, The Ps4's power supply died, Not roaches, Just a dud power supply, My Pro is up high, House is clean, House gets sprayed every 6 months but i just know that a roach is gunning for the pro, No other electrical system, Just the ps4, It will die. There's nothing i can do, It's going to happen, I have a small fan that blows air onto the ps4 & everything but the ps4 Pro will die ha ha. Probably heard about the powerful chips inside. So the PS4 outsells other consoles in NSW? I thought I had seen this article once or twice before... Still, at least it's not as bad as the constant "How to take the perfect cosplay selfie" Article thats been plaguing the front page for the last 3 weeks now. That one is a paid ad though. Not sure why this one keeps coming round again. Urgh yeah, I don't know who's calling the shots, but Kotaku Australia is pretty much the Ninemsn of gaming websites these days. Horrible. If I had a less boring job I certainly wouldn't bother coming to look. This article just won't die. A bit like a cockroach. I have put 'no more gaps' over all my vents and fans to keep the roaches out. I should be fine. oh hey ANOTHER repost. wtf is happening lately. is it really that hard to write something new.